Rather than simply sending messages to colleagues, employees today use Microsoft®Exchange in a more collaborative manner, sharing ever-larger file attachments through different channels.Many organizations are therefore centering their unified communications efforts on Exchange features. This expanded role for Exchange, along with several other factors, can easily stress existing infrastructures. As a result, many organizations find they must update the servers, storage, and networking infrastructure used for Exchange. 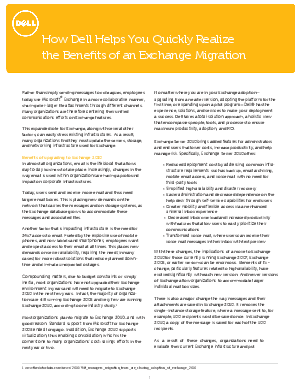 Dell, which has partnered with Microsoft for more than two decades, is uniquely positioned to create systems that extract the most value for Exchange users. By working so closely with Microsoft, Dell has unique insight into Exchange.